The following story appears in the third edition of "Tomahawk Talk," the official gameday publication of the Gwinnett Braves. Pick up a FREE copy at Coolray Field from May 27-June 26. Right-hander Casey Kelly has experienced many highs and lows over a nine-year professional career. Orginally selected by Boston in the first round in 2008 as both a shortstop and a pitcher, Kelly was one of the Red Sox' rising stars before being traded to San Diego in 2010. Two years later, he made his Major League debut for the Padres, going 2-3 with a 6.21 ERA in six starts. Kelly hoped for a return to San Diego in 2013, but suffered an elbow injury that required "Tommy John" surgery. He made just four starts in 2014 and went 2-10 with a 5.16 ERA between the Double-A and Triple-A levels in 2015. 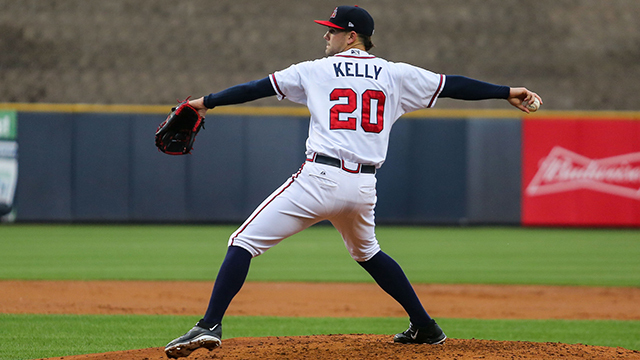 A trade to Atlanta last December offered Kelly a fresh start, and he's thrived thus far with the Braves. Over his first seven games with Gwinnett, he went 2-1 with a team-best 2.63 ERA. Andrew Constant of Tomahawk Talk caught up with Kelly to talk about his days with the Padres, battling back from surgery, his goals with Gwinnett and more. Andrew Constant: Last year was not a great year for you. What did you do in the offseason to get yourself ready and come back stronger in 2016? Casey Kelly: My whole goal last year was to get a full season in and not have any setbacks and make all my starts, which I did. The first year coming back from "Tommy John" surgery, you're going to have some ups and downs, and I definitely went through that last year, but this year I'm back to where I was before the surgery. Each time out there, getting more and more reps and getting more comfortable. AC: Sometimes players just need a change of scenery. Do you feel a fresh start with the Braves has been good for you? CK: I didn't have a sour taste in my mouth moving on from the Padres at all. They are a great organization and they let me start my major league career there and have a lot of opportunities with them, so my time there was awesome. I wish I could have done more to help the team win, but being traded over to the Braves, I love it. It's a legendary organization and growing up watching them on TV, seeing how they go about their business, it's exciting to be a part of now. We're in this kind of rebuild process, it's fun to be a part of. AC: You're from Florida and said you watched the Braves growing up. Were you a 'TBS kid'? CK: Yeah, absolutely. TBS was always on, I was always watching the Braves with Chipper Jones and Andruw Jones and all those guys. AC: In your Major League debut with the Padres on August 27, 2012, you threw 6.0 scoreless innings against the Braves and also recorded your first big-league hit. What do you remember about that game? CK: It was a very memorable experience. It's something I'll never forget and being able to call my parents and tell them that I was going to the big leagues was a very special moment for me and my family. And it worked out that my dad (former Major Leaguer and current minor league manager Pat Kelly) had an off-day and he got to come out to San Diego and watch my debut, so a lot things just went well there and it was unreal. It was a magical day; to be able to go out there and pitch how I did, and get my first hit too, it was such an amazing day. AC: You had the highs of reaching the Majors in 2012 and the lows of having "Tommy John" surgery in 2013. How did you deal with that and remain positive throughout the whole process? CK: It was definitely tough, especially as a young guy, wanting to prove yourself. The days that all you can prove is not having a setback that day or going into rehab and doing the best you can do at it that day were tough. I just had to stay day-to-day and stay positive. I had a lot of support from family and friends and they helped get me through that process. Coming out of that, I learned a lot about myself and I learned a lot about what kind of a pitcher I am. So looking at it now, it was all worth it. AC: Tell me about the early part in your career when you were splitting time between shortstop and pitcher. What went into committing to be a pitcher full-time in 2010 and did you think that you might have a future early on as a shortstop? CK: It was a crazy experience, being 18 and getting drafted in the first round, having the opportunity to play shortstop and pitch and having them not know what they wanted you to do was pretty cool. I did it for a year and we sat down in the offseason and had some very real talks about the future. As a 19-year-old kid, there are things you don't want to hear, but I grew up really fast and ultimately it got me to the big leagues and my dream, so if it was going to be at shortstop or pitcher or batboy, whatever was going to get me to the big leagues I was going to be cool with. AC: You've been part of a couple of trades now (from Boston to San Diego, San Diego to Atlanta). Are these trades something you just have to accept and learn from or do you kind of dweel on the trade for a little bit? CK: The first trade was the hardest for me. I was so young and I loved the Boston Red Sox organization and all the people there. But when I got traded to the Padres, it was a great opportunity to get up to the big leagues at a young age and not have the pressure of the media in Boston. San Diego is much more relaxed in that way. This trade, I was a little bit more mature and that helped me this year. I took the feelings out of it and knew it wasn't personal, it's a business. For me, I'm still the same person I was back then, I just need to keep going out there and show it. AC: You were drafted out of high school as an 18-year-old and you're only 26 now. You've been in professional baseball for nine years now. How have you matured from being a first-round pick in 2008 to now? CK: I don't think I've matured at all (laughs). No I'm just kidding. Each year you figure out what you need to do to get ready for your starts and I know as a starter you're going to get 30 starts; five you're going to feel really good and five you're going to feel really bad and the others are going to fall in between, so you have to learn how to manage the game and minimize damage and not let the game get too out of control. I'm just very excited to be healthy this season. Everything is back to normal and I'm excited to be here and get the chance to throw every fifth day. AC: What kind of goals do you have for 2016? CK: This year, professionally, I've gotten to 500 innings and my next start will be my 100th career start, so I'm doing some pretty cool things, having played now for almost a decade. To be able to hit some landmarks is pretty cool and it helps me stay positive and not dwell on the negatives. It's been fun this year and I'm excited to see where I end up as the season goes on.